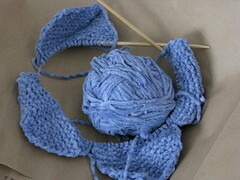 This was going to be a lengthwise scarf – where you start off casting on 400 stitches and knit only 20 rows? I remember starting this on a school field trip when I was teaching, so it’s from 2005 or 2006. Bad idea. Couldn’t keep track of the stitches. Frogged. 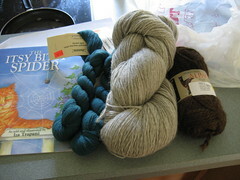 Interesting side note, this summer I bought more of the darker yarn (Classic Elite Premier) from the sale section at a LYS, potentially for Rusted Root. 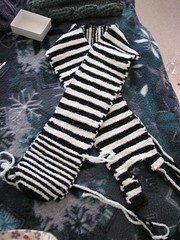 A Zebra Scarf using Plymouth “Oh My” yarn. 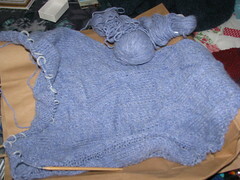 I think I will finish this one and gift it to Lorelai in a few years. I’m pretty sure this is Cherry Tree Hill Suri Alpaca purchased to be a Trellis Scarf, back in April of 2006. Yeah, didn’t happen. 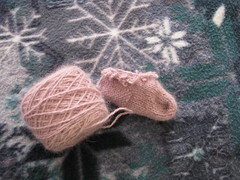 Pink-dusty rose soft, fluffy-ish yarn – tried to become a baby bootie. No go. 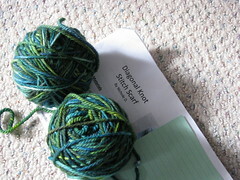 A soft wool, greens / browns (very similar to my Monkey Socks yarn) started out to be a diagonal knot stich scarf. Frogged. A sweater. OMG. 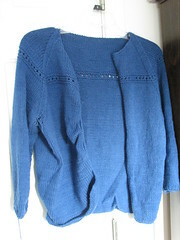 It needs the seams under the arms done and the picking up of stitches on the fronts fixed – I am sure this is why the sweater was tossed into the bag – I tried to pick up stitches and didn’t get enough but I did get puckering. This is something I can save. Sitcom Chic pattern, Cotton Ease yarn – August, 2005. Clapotis #2. Classic Elite Inca Alpaca yarn. Started in October, 2005. Not sure why I stopped. I think I would like to finish this one. 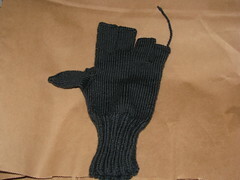 One glove. With a pointy thumb. WTF? Maybe this will go in a dress up box. 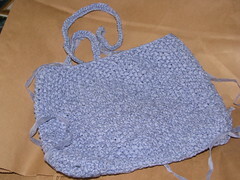 A little bag from April 2005. Sophie? from magknits I think… I think it needs one more handle. And I do have 2 more balls of this ribbon yarn. I should finish it and give it to Lorelai, but it just annoys me. 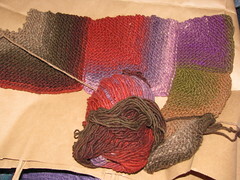 A noro bag, from 11/2006 – obviously never finished. I don’t love this – planning to frog it. I’m sort of done with Noro. A flower petal washcloth. 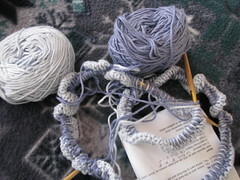 I don’t really like knitting with the cotton chenille, but I think I will finish this one as well. An Irish hiking scarf. Wool-ease I think, was probably started as a gift. 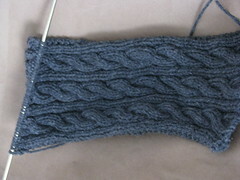 I think this will be frogged – I love cables but that pattern doesn’t do it for me anymore. A Leisel scarf, I think. From July 2006. There’s potential here, but with a different pattern. Frogged. The beginnings of a mouse. I really should finish this and give to Lorelai. Well, it’s out there in the open now. I’ve owned up to these projects, and I do feel somewhat better having frogged a few things. But I’m dreaming of the next projects that will be on the needles… Same story, different day! Maybe I got tired of blue….? I almost can’t believe I did it! 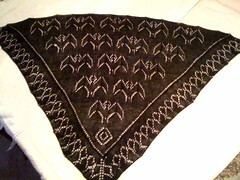 My Batshawl designed by Emilee! One skein of Malabrigo Lace – and I have leftovers! Wa na na na na na na na – Bat Shawl! I’ve yet to remove all the pins to actually try it on, so certainly there will be more photos. Now that I see it pinned out, I think perhaps I should have done one more row of bats – that would have made it just a bit bigger / longer. Luckily, I think the forecast for saturday (when I plan to wear it at the outdoor wedding reception) is 60-ish, so I should be good. Or I could layer it with the satin-y wrap that came with the dress, it’s purple, it could work. I’m so proud of this – I finished a project! Almost makes up for the bag of in-progress projects that I found in the yarn room, but that’s a whole other post. All I can think of when I look at the shawl / think about the shawl isn’t the original Batman theme, instead it’s a clip from “The Wild World of Batwoman” that was on Mytsery Science Theater 3000 – at one point, Batwoman answers the phone, “Batwoman here” – one of the most ridiculous scenes ever, in a very ridiculous movie. Guess which one is her. Our new favorite distraction – my button jar. It’s not a very big collection, and not very valuable (it’s full of inexpensive buttons from JoAnns and other craft stores plus whatever buttons come with the clothes), but Lorelai seems to be really into it lately. She will request, “Play with buttons?”. 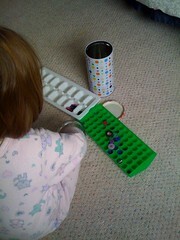 She has her favorites and we practice finding colors. Most of the buttons to her are “Byou” and then “gween” and then maybe “yeh-woah”. I get to knit nearby and keep an eye on all those little buttons and she moves them from jar to the floor to her hands to a cup. For added fun I gave her two ice cube trays. 20 – 30 minutes of fairly peaceful playtime. Lucky for me, my knits of late have not required buttons, but I’ve got some in my queue (for holiday knitting) that do – I should figure out the button choices now and set them aside. Buttons seem to have a way of just walking off in this house – I still haven’t found those other buttons I originally bought for the PrestoChangeO sweater! And now I know about two little legs that are awfully fond of them! I got to have a mini-vacation away this weekend – I went up to visit my brother and sister in law in upstate NY, conveniently located ~45 minutes away from Rhinebeck. Their original plan was to have a party, but in the end with the weather and all it was canceled and instead, on Saturday we all just took it easy and hung out. My other brother and his girlfriend also made an appearance and it was great to just take it easy. Lucky for me, Virginia is a knitter and she was ready to come along to Rhinebeck and see what all the fiber fuss is about. We went on Sunday – the weather was crap – cold, damp, drizzle, but not downpours and it did sort of clear up. Lamb sandwiches and hot cider also help. I really enjoyed it more this year since I had a better idea of what to expect and was also more familiar with yarns / yardage needed for patterns / what I might like to knit up. I am pleased with my purchases and am also looking over my stash in a new light. VA is also a great knitter to do a yarn crawl with and we should do it more often (hint, hint, VA I’m sure there are great yarn shops near you!!) – we scanned, we shopped (smartly!) and we scored! Why didn’t we get a picture of us? 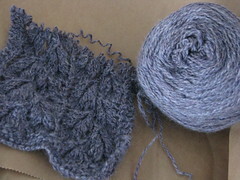 Anyway, here’s what I did get, minus one pattern – a very cute little cabled baby sweater to use with sock yarn doubled. I bought a copy of “The Itsy Bitsy Spider” for Lorelai – autographed by the author, Iza Trapani, who was very sweet. 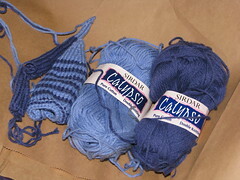 Two skeins of peacock colored “Aussie” lace weight merino yarn (so, 600 yards) – possibly another Ishbel, or Sunflower Shawl. One skein of bulky alpaca yarn for Quincy – or so I thought until I just double checked the yardage (I have 120 yds, that’s 30 yds short!) – so maybe February Slippers, Promenade Scarf or Wonky. Hmm. I really thought it would be enough for the Jared Flood hat. Bummer. 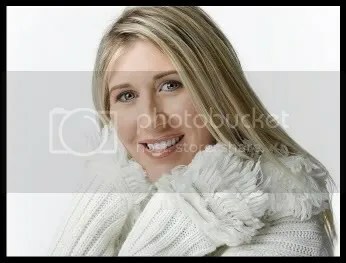 I found it really interesting that I saw a knit sample of this “Every Way Wrap” and really was taken with it – when I saw it in the magazine I totally was not interested. Now I’m thinking about maybe using some of the yarn from my Tilted Duster or Mom’s Hemlock Ring blanket (solid color blue or purple) or some of my Lorna’s Laces Green Line Worsted (multi colored, but so was the knit sample). Hm.. Decisions, decisions. 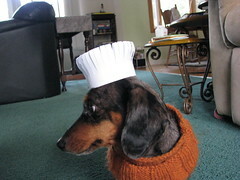 After I finish up projects and gift knitting I will be able to get back to my selfish knitting! Garter Stitch. It’s one of those things every knitter starts out with right? I finally took a picture of my first ever knitting project. It was an afghan. Red Heart yarn, cranberry I think is the colorway. This project was made for Dan when we were dating (back in 2002 – we had been dating for 6 years at that point. We’re married for 5 years this Nov. No such thing as a blanket curse in my opinion) The “pattern” was from a “Teach Yourself to Knit” – which I did, successfully (and left-handed too!). 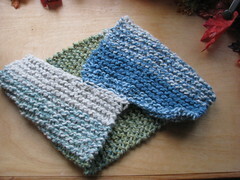 It’s two big garter stitch rectangles, “seamed” together. 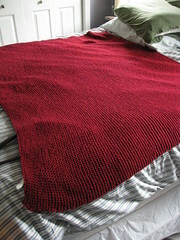 It almost pains me to look at it and I can’t wait to make us a new blanket. But, Dan likes it and it does effectively work (imagine that!) – and even covers the bed! Sometimes, garter stitch is not all that bad. I’ve had cowls on the brain this week – maybe because it’s getting cooler cold outside, and the scarves are driving me a bit crazy with the long tails. 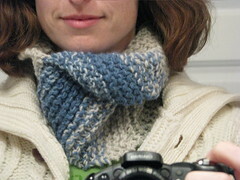 And I wanted a new cowl for Rhinebeck. 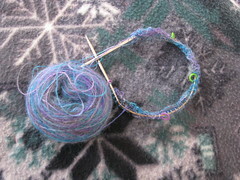 So, I pulled out yarn I got at Rhinebeck last year (from Jamie Harmon) – bulky yarn, great blue-green-white colors – a few hours, some big needles (even Dan commented – so what gauge are those needles? 13s? He was right!) and Wham, Bam, Thank you Lamb! I’ve got a new cowl and it’s awesome. Love. And I’m so buying more of this yarn this weekend! 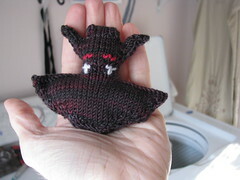 Actually this was a super quick test knit project – Little Bat Ornament by FickleKnitter on Ravelry – I used leftover sock yarn (Lenore appropriately) and it could be done in less than a day. Also could be a great finger puppet if you only seam and do not stuff. 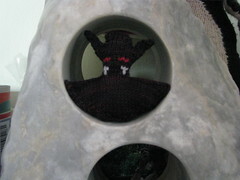 The pattern is free for the month of October, so go make one or a bunch and you’ll have a colony! Lorelai has her costume, so that’s good. 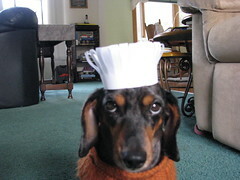 Jackson does too actually – he won a ladybug costume, but today I’m playing a bit and made him a chef hat. Disclosure: This is a Mama Buzz review. 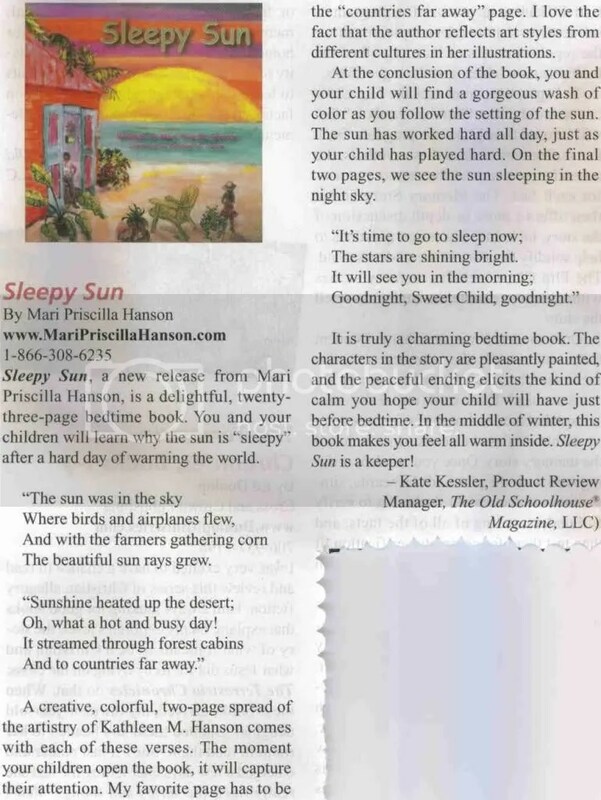 The product was provided by Mari Hanson for this review. Books are a big part of Lorelai’s day (yay!) – she will “read” them on her own during the day, we read to her during the day, and of course, we read a few stories at night as part of the bedtime routine. We keep about a dozen books or so in her room and let her choose which ones will be read at night. She has the tendency to pick the same books over and over, so occasionally I will slip in a new book and either I will suggest it or she discovers it. 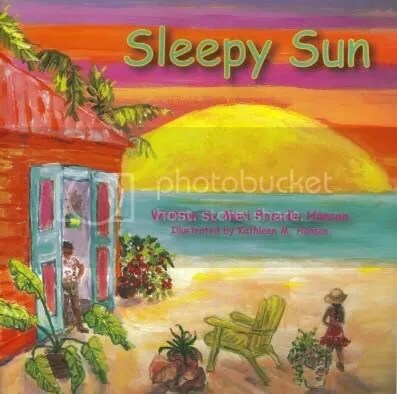 We recently received Sleepy Sun by Mari Priscilla Hanson. Thank you Mari Hanson for writing such a sweet little book. Lorelai enjoyed reading the story and there are plenty of details in the photos that we can look for in addition to reading the story. I appreciate the opportunity to talk about global diversity with her, even though she’s only 22 months. Her grandparents and family do a lot of traveling, so we can talk about family members while we read this story. The book is for children who are toddlers through young children. We are just starting to get into “paper pages” books and this is a good introduction. I could see this being a beautiful board book as well if that was ever an option.